Shazam is a comic book character created by Bill Parker and C. C. Beck for Fawcett Comics. He is an ancient wizard (Whiz Comics #2 gives his age as 3,000 years) who gives young Billy Batson the power to transform into the superhero Captain Marvel. 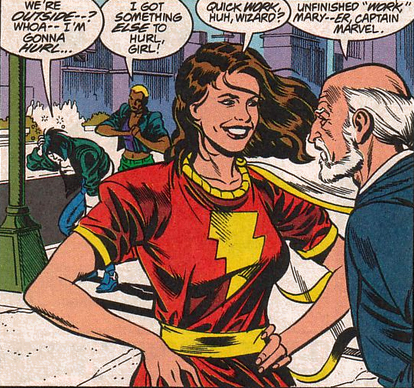 Because DC Comics has billed Captain Marvel's adventures under the name Shazam! since 1973, the superhero is often mistakenly referred to by his mentor's name. Because of this, in 2012 Marvel's name was officially changed to Shazam. Abilities: Magically bestowed superhuman strength, speed, stamina and courage; Invulnerability; Nigh-omnipotent mastery of magic and mysticism; Omnipresent and omniscient; Telepathy. Origin: When Shazam was a young boy, some 9000 years ago, he was chosen by six long-since forgotten gods to become their champion! When Shazam was a young boy, some 9000 years ago, he was chosen by six long-since forgotten gods to become their champion! These gods developed a magic code word formed from the first initial of their respective names. At one point, Vlarem is seduced by a demoness disguised as a beautiful woman, and the two of them conceive two half-demon offspring, Blaze and Satanus, much to the displeasure of the gods. Vlarem later creates the Rock of Eternity from two large rock formations--one from Heaven and one from Hell--to hold the "Three Faces of Evil", a dragon-like demon, captive. powers of six Egyptian gods. But Adam's power soon corrupted him and he became less benevelant. Shazam renamed him, Black Adam but unable to strip him of his powers, Shazam banished Adam to the farthest star for his crimes. He also taught spells to the immortal Oggar, but gave him cloven hooves and made sure that he could only use a spell once when he discovered his evil intentions. Shazam once again waited to find a new successor. Unwilling to make the same mistake twice, Shazam decided to bestow his powers on a boy, much like what had happened to him. Ages passed until Shazam discovered a boy worthy enough to be granted those mighty powers! Shazam choose young Billy Batson to receive the powers of six of the mightiest gods and mortals. When Billy Batson says the name "Shazam," he is transformed into an adult version of himself -- the world's mightiest mortal... Captain Marvel! Although Shazam is killed--as prophesied--by a giant granite block falling upon him, Billy/Marvel can summon the ghost of Shazam for guidance by lighting a special wall sconce in Shazam's lair, the Rock of Eternity. 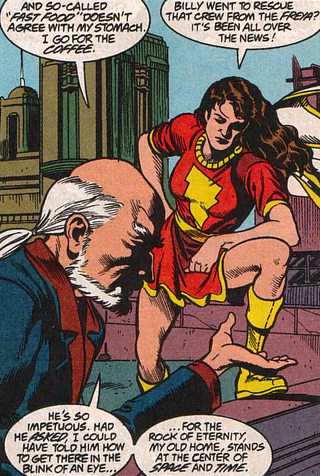 More superheroes soon joined Marvel in carrying on the legacy of Shazam, including Marvel Family members Mary Marvel, Captain Marvel, Jr., and the Lieutenant Marvels. Billy had many adventures as Captain Marvel but was eventually trapped by the evil Dr. Sivana in a sphere of Suspendium. This Suspendium trapped Captain Marvel, his friends, and the evil Sivanas in suspended animation for twenty years! Shazam waited patiently for the Suspendium to wear off, so that Captain Marvel could regain his title as the champion of the world. It was revealed at this time that Shazam and the Marvels lived in a parallel universe to Superman, Batman and the other Earth-One heroes. Captain Marvel's original earth was referred to as Earth-S.
A cataclysmic multi-universal crisis occured which merged the earths of Superman with Captain Marvel's and other heroes. It was during this time that Shazam and the Marvel's history was in flux. 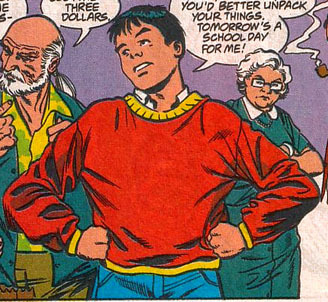 For a short time, while the newly formed universe was trying to realign itself, Billy Batson had a different set of parents, Shazam himself has a bit less caring and "Uncle" Dudley became Billy's real uncle! This flux soon corrected itself and Shazam and his origin became similar to his pre-Crisis one. Shazam took up residence on the Rock of Eternity (a temporal spot in space/time) where he records the adventures of the Marvel Family. Shazam has regained corporal form and for a brief time lived with Billy Batson so he he could regain an understanding of humanity. Sometime later Shazam gained godhood and joined Zeus, Ganthet, Highfather and the Phantom Stranger, and to form the Quintessence -- a group of all powerful beings who kept tabs on the order of the universe. It seems that Shazam has gone back to the Rock of Eternity and still watches over his charges. Shazam called upon the Spectre to free Superman from being controlled by the demon Eclipso. This action broke a covenant between Eclipso and the Spectre, and set Eclipso permanently at odds against the wizard. Possessing the body of the Atom's ex-wife Jean Loring, Eclipso corrupted the confused Spectre into joining forces with her, and began a war against all magic-powered beings in the DC Universe. 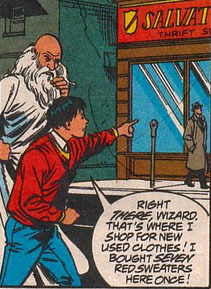 Because of his previous action, Shazam was one of the duo's primary targets. 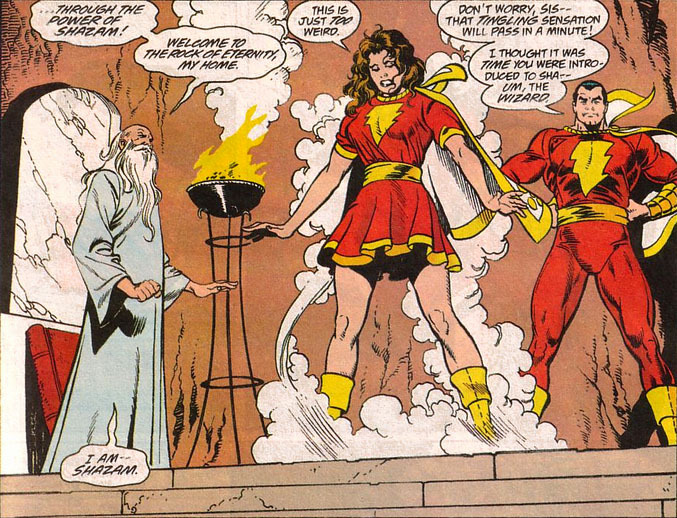 In the Day of Vengeance miniseries, Shazam enlisted Captain Marvel to keep the Spectre at bay, while the wizard gathered all of his power to battle him. With the assistance of the newly-formed Shadowpact, a band of magic-based heroes, Marvel fought the Spectre nearly to a standstill, but the Spectre escaped and made his way to the Rock of Eternity to confront Shazam directly. The Spectre overpowered the wizard, absorbed his magicks, and killed him; and the Rock of Eternity disintegrated above Gotham City into "a billion pieces" and exploded, freeing the Seven Deadly Sins and sending a de-powered Billy Batson falling into the city. Billy found he was still able to transform into the Captain before he struck the ground by saying the wizard's name as usual . After having his spirit dispersed, Batson had advanced to the wizard's position as Keeper of the Rock of Eternity. But after Batson's advancement, Black Adam along with his resurrected wife Isis was able to take control of the Rock for their own power. It was revealed that the Wizard's spirit form was not completely destroyed by Spectre, but sealed away in the separate Rock of Finality. With the help of Jay Garrick, the Wizard's spirit was released from the Rock of Finality. 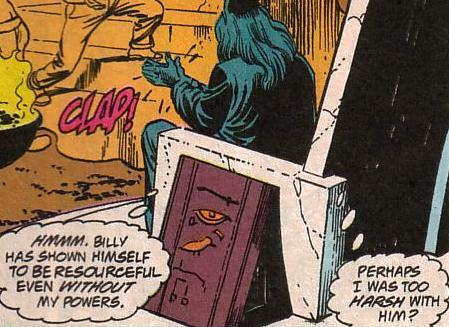 Seeing Batson support his sister who had been corrupted and both becoming a "Black Marvel", the wizard's spirit stripped both Billy and Mary of their powers saying they "had failed him". 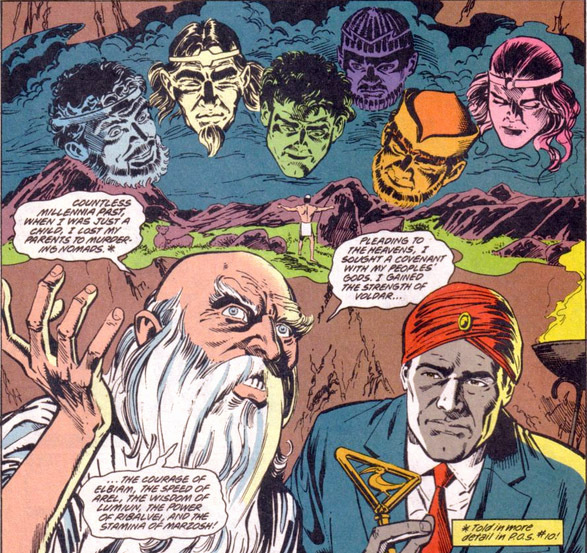 The Wizard said that as Freddy Freeman's current "Captain Marvel" powers come directly from the six gods and not under the wizard's control, Freeman "would be dealt with". (Justice Society Vol 3 #25) It remains to be seen what the wizard meant by that statement against Freeman and his role as the six gods' champion. Powers Of Shazam: The following represents the potential magical abilities available to wielders of the Power of Shazam. Even if demonstration of such abilities has not been explicitly shown in a canonical resource. Not all of the following abilities are represented by the same Deities. Variations of these powers may apply depending upon the wielder in question. Accelerated Healing - Granted by Atlas, Shu, Apollo and Marsosh. Chosen ones have incredible amounts of durability and invulnerability however if for some reason they are harmed their unique physiology allows their physical wounds to heal and at accelerated rate. They can survive incredible amounts of damage to their bodies given enough time. Clairvoyance - Granted by Solomon, Zehuti, Minerva and Lumiun. Chosen ones are clairvoyant to all situations. They can understand situations from many angles including futuristic and past consequences to actions. Also understood as superhuman awareness with such clarity that chosen ones can see into the future of their actions. Divine Empowerment - All of the powers given to the chosen ones are given through Shazam and come directly from Gods. These gods include Solomon, Hercules, Atlas, Zues, Achilles, Mercury, Shu, Heru, Amon, Zehuti, Aton, Mehen, Menthu, Selena, Hippolyta, Ariadne, Zephyrus, Aurora, Minerva, Marsosh, Arel, Ribalvei, Voldar, Elbiam, Lumiun and Apollo. Some chosen ones are given their powers directly from the gods and chose not to go through Shazam. Divine Grace - Granted by Achilles, Mehen, Menthu, Selena and Elbiam. Chosen ones have innate luck and divine guidance in a largely unseen way. Mostly a psychological ability, they are the chosen of the gods and therefore are in the gods' favor. Their grace allows for seeming finesse in their actions and situations. Eidetic Memory - Granted by Solomon, Zehuti, Minerva and Lumiun. Chosen ones have photographic memory. They can remember each piece of information they learn while in their superhuman forms. With this they can study situations and reevaluate them as required. This power is used in conjunction with their clairvoyance. Energy Projection - Granted by Zeus, Aton and Ribalvei. Chosen ones can project their transforming lightning bolts as offensive weapons. An often unconventional weapon, chosen ones have been seen striking others including other chosen ones with their called upon lightning bolts. Energy Resistance - Granted by Zeus, Aton and Ribalvei. Chosen one's physical forms have increased resistance to all magical based attacks and can take such attacks full on without sustained damage, such as; being hit with spells from magical opponents or even the magical lightning of other chosen ones. Enhanced Intellect - Granted by Solomon, Zehuti, Minerva and Lumiun. Chosen ones are given superhuman brain activity and are provided by counsel and guidance when needed. They are also granted knowledge of all languages, warfare, mathematics, and other scholarly knowledge. Flight - Granted by Mercury, Heru, Zephyrus and Arel. Chosen ones can soar into the skies through an act of sheer will. They can hover completely still or effortlessly achieve sub-orbital levels and travel across the planet in blinding speed. Healing - Granted by Zeus, Aton, Apollo and Ribalvei. Chosen ones can heal themselves or others with their magical lightning. Chosen ones can use their lightning to save victims instead of injuring them at their own will and if they take heavy damage they can call the lightning to heal themselves as well. Hypnosis - Granted by Solomon, Zehuti, Minerva and Lumiun. Chosen ones can hypnotize anyone who looks directly at them. Hardly used by today's chosen ones this ability can be understood as a chosen one's ability to manipulate their opponents or allies for various purposes. Indomitable Will - Granted by Achilles, Mehen, Menthu, Selena and Elbiam. Chosen ones have incredible amounts of willpower which they utilize on an almost daily usage. A psychological power, their willpower allows them to fight on despite overwhelming odds and seemingly unbeatable situations. In most cases their willpower is in excess to their innate nature of good will, however that is not always true and their will can be bent to more destructive means. Invulnerability - Granted by Achilles, Mehen, Menthu, Selena and Elbiam. Chosen ones have incredible amounts of durability, so much so that they are considered largely invulnerable to most if not all forms of physical damage. That isn't to say that they cannot be harmed but it would require one as powerful as them to hurt them physically. Sometimes called the Courage of the Gods, it is also mostly a psychological ability allowing the chosen ones access to large amounts of willpower and grace. Magic - Granted by Zeus, Aton and Ribalvei. Chosen ones have incredible amounts of magic. Specifically, their entire superhuman makeup is one large magical spell. 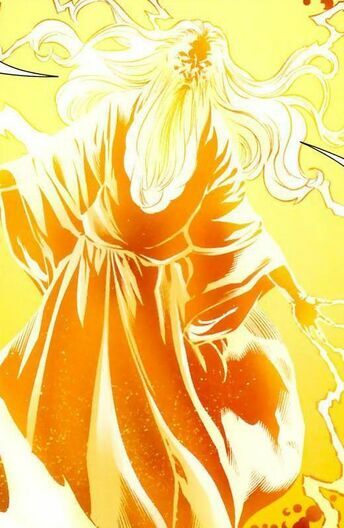 Sometimes called the Power of the Gods, most chosen ones choose to use their magic through lightning bolts, transformations, resistances, enhancements, and other spells. Multilingualism - Granted by Solomon, Zehuti, Minerva and Lumiun. Chosen ones are omnilingual and can read, write, speak and understand all languages. With this they can communicate to even aliens and other lifeforms. Self-Sustenance - Granted by Atlas, Shu, Apollo and Marsosh. Chosen ones can survive extended and even indefinite periods of time without sleep, food, water, or air. They can even survive harsh conditions such as deserts or tundras without harm. Furthermore they can survive the void of space or gaseous zones of other planets. Superhuman Reflexes - Granted by Zeus, Aton and Ribalvei. Chosen one's physical forms have increased physical reactions and physical attributes to allow for their feats. As such they react more quickly in fights, make quick mental decisions and increase their height, weight, muscles and mass depending on their transformation. Superhuman Speed - Granted by Mercury, Heru, Zephyrus and Arel. Chosen ones have incredible amounts of speed which allow them to move, react, and easily move at speeds far exceeding Mach 10 within Earth's atmosphere. It is possible that other uses of their speed aside from running and flying. Superhuman Stamina - Granted by Atlas, Shu, Apollo and Marsosh. Chosen ones have incredible stamina and endurance. They seem to be able to fight on forever and some many even survive without sustenance. If they were ever harmed their limitless metabolism would surely heal their damage. Superhuman Strength - Granted by Hercules, Amon, Hippolyta and Voldar. Chosen ones have incredible physical strength, enough to lift at least 100 tons. They can effortlessly bend steel, punch through walls, and lift massive objects. They've also been seen able to crack the crust of planets, physically hold off multiple heroes and tear humans apart. Teleportation - Granted by Zeus, Aton and Ribalvei. Chosen ones can teleport to locations such as the Rock of Eternity with but a thought and an action. They can only teleport to this place and only from it, they cannot teleport elsewhere or at will to other locations. Transformation - Granted by Zeus, Aton and Ribalvei. Chosen ones almost always transform into their godlike forms from their human personas. In certain situations they don't have physical changes such as aging or sustaining an age and this can lead to theoretic immortality but once they revert to their original forms they take on whatever ailments they had sustained (such as an injured leg, aging thousands of years or having a broken arm). Keeper of the Rock of Eternity: As the Guardian of the Rock of Eternity he is one with the Rock as it is a part of him. He channels the energies of the primal God-wave and the Greek Lords of Magic through the Rock of Eternity. As such he is infused with the duty to keep the power and the magic of the earth realm in balance. As keeper of the Rock of Eternity he also holds the dark forces at bay. Inherent Omnipresence: apparently possessing the power to be everywhere, at all times (i.e. multiple dimensions and places in time. Inherent Omniscience: apparently possessing the power to know anything that he chooses to know and can be known . Telepathy: ability to read the minds of others and project thoughts. Sorcery: Nigh-omnipotent mastery of magics and mysticism. Genius-Level Intellect: Knowledgeable about basically everything. Bound to the Rock of Eternity though the Wizard's spirit can leave the Rock of Eternity for short periods of time. It should be noted that the Wizard gets weaker the longer he is away from it.